Mabel Hilda “Micky” Kurtaneck, mother of Timothy (T.K.) Kurtaneck, director of church relations and youth leadership at CE National, died on Saturday, November 5. Her late husband, Nickolas, was a Grace Brethren pastor and on the faculty at Biola University. Her obituary appears below. 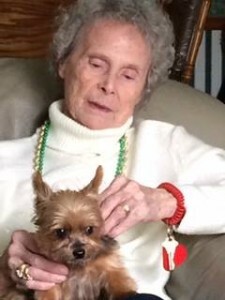 Mabel Hilda “Micky” Kurtaneck of Winona Lake, Ind., died at 2:30 a.m. on Saturday, November 5, 2016, at Grace Village Health Care of Winona Lake, Ind., at the age of 91. Mabel was born on June 8, 1925, in Derby, England, to James Frederick Walmsley and Hilda (Frost) Walmsley. On August 26, 1944 she was married to Nickolas Kurtaneck, who passed away in 2009. She was a resident of Kosciusko County, Ind., for the past four years. She moved to western Pennsylvania in 1945 as a war bride. Mabel resided in Winona Lake, Ind., from 1953-1959 while her husband attended Grace College and Seminary in Winona Lake, Ind. She lived most of her life in Southern California until she returned to live at Grace Village Retirement Community in Winona Lake in 2013. She will be lovingly remembered by her son: Timothy (wife Dana) Kurtaneck (Warsaw, Ind. ); daughter: Charise Ott (Garden Grove, Calif.); and four grandchildren: Rebekah and Nicholas Kurtaneck (both of Warsaw, Ind. ); Jonathan and Blake Ott (both of Garden Grove, Calif.). She was preceded in death by her husband. Interment will take place at Rose Hills Memorial Park in Whittier, California. Arrangements were entrusted to Redpath-Fruth Funeral Home, 225 Argonne Road, Warsaw, Ind. In lieu of flowers, memorial donations may be directed to Operation Barnabas Scholarship Fund, c/o C.E. National, P.O. Box 365, Winona Lake, Ind. 46590 and would be appreciated by the family.